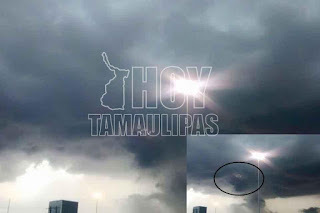 CIUDAD VICTORIA, TAMAULIPAS - A photograph of lights in the shape of a UFO was taken by a resident of Ciudad Victoria and subsequently uploaded to the Facebook social network. Facebooker Luis Daniel Castillo Vega published the photograph, allegedly taken on Thursday, June 2  shortly before a thunderstorm. "I had just finished working out when I noticed considerable lightning in the sky. When I tried to take a photo, I noticed that it contained a group of nine (9) lights which were not visible to me when the photo was taken. But if you look clearly, you can see a group of unidentified objects - seemingly a UFO. This photo was taken in Cd. Victoria, Tamaulipas at the Siglo XXI Park on 2 June 2016." A powerful storm, accompanied by wind gusts and hail, was unleashed over some parts of the city after the photograph was taken.